Favorite food: Any food that tells him something about the personality of the one who prepared it. Disliked food: Canned food, compressed food, junk food, etc. A young man who sells information for his own enjoyment. He claims to love the entire human race except for Shizuo Heiwajima, and exhibits said love by putting humans in often miserable conditions and observing their reactions. He attended Raira Academy with Shizuo, Shinra and Kadota. According to Shinra, Izaya and Shizuo hated each other with a passion almost from the point they met. In the novels Izaya framed Shizuo for crimes on several occasions. In the anime he puts Shizuo in constant problems, such as gangs attacking him daily up to framing him of crimes. He is a master of parkour, and also quite skilled with his flickblade (the blade he uses must be slightly opened before the mechanics of it springs opens the blade - a switchblade will open on its own after the user presses a switch) as he is implied to be the only one capable of leaving numerous cuts in Shizuo's bartender suit after a fight in the novels. In the anime, he shaves a gang member's head bald without him noticing it. He is also fluent in Russian, which is exhibited in the final episode and episode 13 when he speaks with Simon. Izaya has two younger sisters, Mairu and Kururi, who are twins and troublemakers. He claims to have grown up in a normal family whose only abnormal trait was their naming habits. He does not like his sisters and find them to be unlovable, saying that if even he can not like them, he expects no one else to ever be able to either. His name comes from a combination of the biblical Isaiah and Japanese for "the one who looks over the crowd." In the novels, Shinra is the only person that Izaya doesn't consider as one of his "humans." 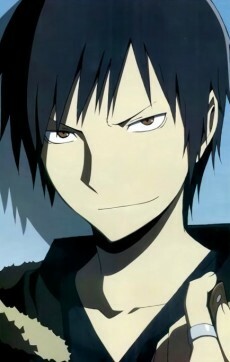 Rather, Izaya considers Shinra as his only friend (which is rather rare). Though it was hinted that he also cares for Saki, despite his manipulation towards her. It was stated that he was like her gaurdian. He seemed to be genuinely sad when Simon informed him that she left Ikebukuro with Kida. In volume 9 of the novels, Izaya treats Shinra as his only friend, letting himself be seen as guilty and put on protective custody for "stabbing" Shinra, which was supposed to be Nakura's fault. It is stated that Izaya greatly envies Shinra because Shinra's standards were far departed from any other human's, even including Izaya's. He had always thought of himself as being in a position to observe humans and therefore standing on a higher pedestal than those around him. Izaya had always thought of himself as being in a position to observe humans and therefore standing on a higher pedestal than those around him. But unlike Izaya, Shinra was living in a different world in the real sense of the word. He is a part of the anonymous online gang the Dollars. He is usually seen pretending to be female online and talks in a feminine manner in the chatroom. His screenname is "Kanra."